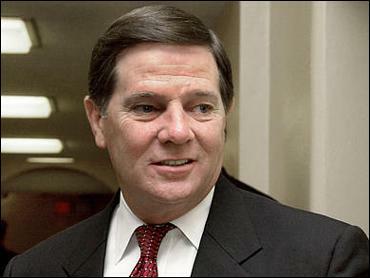 Three consultants to a political action committee formed by U.S. House Majority Leader Tom DeLay were indicted Tuesday by a Texas grand jury and charged with making illegal campaign contributions. Also charged were eight corporate donors, including Sears and Cracker Barrel. DeLay, who was not charged, accused the prosecutor of using the investigation for political purposes. "This has been a dragged out 500-day investigation, and you do the political math. This is no different than other kinds of partisan attacks that have been leveled against me that are dropped after elections," the Texas Republican said. The grand jury has been investigating whether $2.5 million in corporate funds were used illegally to help Republican candidates win elections in 2002 that gave the GOP a majority in the Texas House for the first time since Reconstruction. The GOP later used its majority to redraw Texas' congressional districts to favor Republican candidates. Texas law prohibits the use of corporate money for political activity. The Austin American-Statesman reports that those charged include John Colyandro, the executive director of DeLay's PAC, Texans for a Republican Majority; James Ellis, a key aide to DeLay; and Warren Robold, aWashington, D.C., fund-raiser. Ellis was charged with money laundering. Colyandro and RoBold were charged with unlawful acceptance of corporate political contributions. The eight companies were charged with making illegal political contributions. Calls to the defendants or their lawyers were not immediately returned. Sears spokesman Chris Brathwaite said the company was "surprised by the indictment because Sears' contribution to this PAC followed all applicable state and federal laws." DeLay was not questioned or subpoenaed as part of the grand jury investigation. The second-ranking House member dismissed as frivolous a complaint filed with the House ethics committee that alleges he abused his office for political purposes. Leaders of the House ethics committee said they soon plan to present to committee members information they've obtained on a three-part complaint filed by Rep. Chris Bell, D-Texas. The 10-member committee, equally divided by party, could send the allegations to an investigative subcommittee, dismiss some allegations while ordering a probe of others or throw out the complaint. "I think people see this for what it is, at least that's what I've seen," DeLay said.